» with a STATED 95.9% survival…ONE. You read correctly. One shaft. I repeat . » technique for years !! » And finally, the conclusion. » 20 years, and I am not alone. Can YOU see here that just ONE HAIR has regrown??? … besides lots of other crap within his comment and “conlusion”. Maybe this is one reason, because nobody responded him until today? And how do we all know for sure this is not just the result of just regular fue ht? Has gho had the reputation and results for many hst patients for many years? Answer is no. Sorry need to see many first. » many years? Answer is no. Sorry need to see many first. If you’re “Dagobert Duck”, you’ll be able to see yourself with a full head of hair within the next few years. I referred to approx 800. Go to the article and check for results. As far as the donor pictures, I find them ambiguous. Do they truly reveal that a true modern medicine miracle has occurred ?? NOW, if someone is declaring the biggest multiplication event since Jesus did that thing with the fish and bread, you better provide some evidence apart from " text and tables"
I hope multiplication will become a reality, but is there enough evidence for it here? Make up your own minds and get independent medical opinions. I am entitled to offer my opinion, which I have done, now you must look for results yourself. Dr. Woods, I am one of the biggest Gho-sceptic here, but I find your arguments pretty poor. Now I am beginning to understand why Gho has been able to survive all these years with his unproven techniques: because Gho is more intelligent than the HT doctors who attack him. A few weeks ago, I tried to chat with bverotti on email, and I was ready to counsel him, but he chose to ignore my emails. You see? You guys are funny. » I referred to approx 800. » Go to the article and check for results. » that a true modern medicine miracle has occurred ?? » apart from " text and tables"
» for it here? Make up your own minds and get independent medical opinions. I have to agree with SD, I was disappointed with Dr. Woods analysis, I wish there were more depth to his analysis, he dismissed the whole thing the moment he read that it was about transected follicles, there’s more to it , I am not a doctor and even I know that. » I am not a doctor and even I know that. I’ve got absolutely no idea of the science involved so it would be wrong for me to dismiss or champion the research he has completed. I desperately want it to be true. I have to say though i agree with people when they say we need to see results. If it is carried out over 5 or 10 cases and results are good then that is the only testament needed, so i’m hopeful that maybe that will become the case soon. » » I am not a doctor and even I know that. » that will become the case soon. We need other doctors to experiment for us, Dr. Gho is working at snail pace! In my opinion, Dr. Gho has misled hair loss sufferers in the past, he has no credibility. If he has developed a way to get two follicles out of one follicle, where’s the photographic proof? » follicle, where’s the photographic proof? i am new here and my english is not very good but i’ll try I went back in dec 2008 for an consult with dr Gho and dr Gho has admitted to me that he can not give me a full head of hair, he even told me its impossible, because he can not copy mother nature he said. This were his own words p.s I am from Holland. hello nederlander, welcome to the forum. Could you give us more details? We are very suspicious of new members because many times are false newcomers. Anyway, could you hep me to translate from dutch in this thread? I don’t need a word-by word translation. Its enough if you understand the content of the first posts, to see if Joling got a transplant from TransHair and or Laser Aesthetic, years ago, and very important, if Joling advertised happily these hair transplants. » I am from Holland. » are very suspicious of new members because many times are false newcomers. » everything i tell about gho is the same he will tell you if you go for a consult with him. » Anyway, could you hep me to translate from dutch in this thread? » advertised happily these hair transplants. » » I am from Holland. What good would having posted a fully regrown recipient area photo have done. You don’t even believe the very well marked and photographed donor photos where you can clearly see the pigmentation color change resulting from the needle extraction. Out of these marks, new hair is growing. I replied to your post in the hair transplant forum and linked a study that seriously brings into question your allegations about the regeneration of transected follicles left in the donor area. You of all people should know better than to dismiss the observation of Max Planck on the progression of science. You have dismissed this research without so much as lifting a finger in an attempt to reproduce the result. That demonstrates bias to pre-conceived ideals learned yesteryear. Dr. Gho fully documented and revealed his technique in depth. No details have been left out or purposely hidden that would prevent a researcher with average skills from reproducing the results. After-all, that is the purpose of publishing. Dr. Gho has labored for years to perfect this technique. He has fully revealed the technique. The rest is up to the hair restoration community at large. » from the needle extraction. Out of these marks, new hair is growing. » results. After-all, that is the purpose of publishing. Hello again NLander. I am sorry if I sounded harsh, but it is very easy to register with a new name and post things to support certain views. It has happened before, persons posting under several different names. So Gho rejected you because you were too bald? how bald are you in the Norwood scale? (google for “Norwood scale” and you will see the depiction of each grade). We will try to find more people like you, i.e., rejected by Gho “because they were too bald”. Graft counts are also wrong there have been cases showing 1000 grafts when really the guy had 2500. The doctor can throw the extra 1500 in providing he agrees to put pictures up and say nothing after all he only paid for 1000. The hair transplant business is a very corrupt and shady business everyone who has some experience in it knows it. Nederlander, are you sure Joling got transplants from both clinics (TransHair and Laser Aesthetics)? » » hello nederlander, welcome to the forum. Could you give us more details? » you go for a consult with him. » » Anyway, could you hep me to translate from dutch in this thread? » » advertised happily these hair transplants. » » » I am from Holland. Only time will tell. But one thing is for certain, if these other HT surgeons continue to attack without lifting a finger to attempt to reproduce the results, it will take a very long time. Keep in mind, Gho’s procedure requires about a year for the donor to heal (as shown in Dr. Kim’s follicle transection regrowth studies). Since he can only move a limited number of grafts per year, the best case scenario for restoring a NW7 is probably 5-7 years of successive treatments. IMO, HST is most suitable for patients with limited balding who want to maintain a full head of hair as the years progress. But if a really bald guy wants to hang in there long enough, Gho’s website clearly states that he’ll treat any patient with male pattern baldness. Patients with other forms of baldness are unsuitable for the treatment for the same reasons they are unsuitable for standard HT–the lost hair eventually grows back, so you don’t want to put new grafts in the temporary bald patches. » So Gho rejected you because you were too bald? » will see the depiction of each grade). » they were too bald”. That’s quite interesting considering Bverotti claimed Gho recently put 1600 (?) grafts on a NW7. In addition, there was a poster on hairsite years ago who fully documented his transplant with Gho. He was a very high NW level, and Gho moved a limited number of grafts to his hairline. Considering the limited number of grafts moved, it actually looked pretty good. Keep in mind, the donor requires time to heal, so Gho can only move a limited number of grafts per year. For those patients who believe a NW 7 can get a full restoration in less than 5-7 years of treatments, you really need to re-read what this procedure actually is. * Absolutely no scarring. Not just "no visible scarring," this means no scarring at all! * No cutting, no stitches: HST is a treatment, not a surgical procedure! * Our specially developed liquid ensures that the grafts are replaced in optimum condition"
"Can anyone be treated with the HST method? Yes, HST can be used to treat anyone. You can meet with one of our doctors for a free, no-obligation consultation to discuss what HST can mean for you. In a very few situations (such as Alopecia Areata), we cannot recommend the procedure." » transplant that he gets. He probably does it for money or free transplants. Well, keep in mind the poster I mentioned above who was completely bald and fully documented his procedure on hairsite. He was very happy with the result. 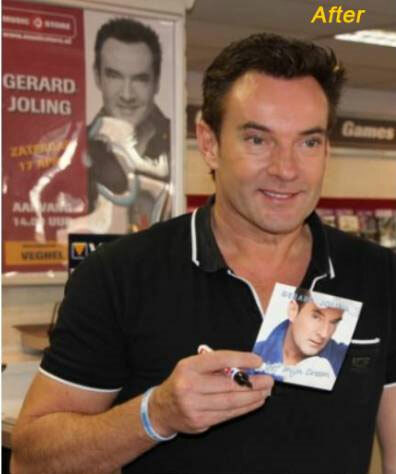 As far as Joling adverstising every hair transplant he ever gets, that doesn’t explain why he has spent so many years hiding under a rug, only to ditch the rug after HST. I expect all kinds of new posters to show up from Holland with wild claims about how Gho’s technique doesn’t work. IMO, it is important to stick with the peer-reviewed literature and have open-minded passionate researchers attempt to duplicate the results. Everything else, at this point, is hearsay. Joling is a puppet. We don’t even have a decent “before photo”. I think he claimed that his donor regrew, but we don’t have close photos of his donor either. » 1600 (?) grafts on a NW7. bverotti claimed that Gho rejected NW6-7 patients, and then I posted a former message by bverotti, where he said Gho treated a NW6 with 1600 grafts. bverotti never replied to explain his contradiction. In fact, bverotti never reply to my messages here at hairsite. I wonder why. » level, and Gho moved a limited number of grafts to his hairline. » need to re-read what this procedure actually is. Bond, don’t try to justify Gho. On Nov-2005 Gho claimed 80% regeneration, so he has had 5 years to produce a full head of hair. Even if this took many years, why he is not even starting this attempt? » no scarring at all! » “Can anyone be treated with the HST method? Thanks for the advertising. I am not interested. » only to ditch the rug after HST. So he was hiding under a rug, and 1500 grafts made the miracle? Got a before photo? A good one? Now other doctors can test the technique. Dr. Wood’s attitude and argumentation is really regretable.